The room was incredible, breakfast on the other hand - was not free so had to go out for breakfast. Dinner was a little expensive - customer service could use a lot of improvements. Yes, I would recommend the hotel for the room - when you walk in there is a living room, with a couch, chairs, a tv, desk and business chair, French doors which I liked with a tv in the bedroom. Just off of the strip, but on a very less busy road which was appreciated. The hotel itself was great, breakfast bar was very good as well as all other amenities. The only complaint I had was that we booked a room for 3 people and the website said that it included free breakfast for those 3 people, yet the hotel itself charged us for an extra person for breakfast and said that it only included 2 people for breakfast. They would not negotiate either, regardless of me showing them exactly what my itinerary said. I got told 2 different things from 2 different people within the hotel as well, one saying the itinerary was correct before breakfast, and the other telling me that it was wrong after breakfast and that we had to pay more. Unfair. I enjoyed a good night sleep and the breakfast buffet I had was excellent nice variety to choose from everything from diet low calorie foods to choose grilled items, I hope to be back soon. Dorothy B.
I liked that it was a little away from the Strip and none of the excessive smoke associated with it - great if you are visiting with little kids. Everything was great. Rooms are pretty big and staff is very welcoming. Friendly staff, didn't spend too much time at the hotel but we were very comfortable and the room was nice, cute set up. What a great room! Got it last minute and it was convenient and comfy! I have stayed at Marriotts in other places and decided to try this one during my recent weekend in Vegas. The lobby and pool area is smaller than other places but it might be due to the area the hotel is located on. It's near the Wynn, Encore and Rio casinos so it's perfect to visit for buffets and gambling. As for the room it is as great as I expected it to be. Clean, presentable and updated. The beds as usual was comfortable which is also why I chose Marriott. The best pillows and beds. Overall great experience. Room average however it came with trash on the floor, there are no towels, soap or shampoo in the shower area. not a lot of bang for the buck. After trying to find a place to stay in last minute we walked ino this place. We were told no more rooms. Understood it was a hoilday weekend but we have our travel app so it was eaxy to get a room. Wish 7 had the options to get more then one room. This hotel is small but comfortable, pretty but not over-the-top, and convenient without being right in the middle of Vegas strip chaos. It is within easy walking distance to the monorail, which is ABSOLUTELY the way to go with traveling from the hotel to the strip. Avoid the drunk crowds spilling their drinks on you in the street and take the monorail. The hotel staff was friendly and the rooms were small but nice. No complaints. It was a busy holiday weekend and a suite was cheaper at this hotel than a normal entry level room at a hotel on the Strip. The monorail is a short walk from the hotel. Rooms are recently updated and sharply decorated. Bed was insanely comfortable. We had a night cap at the hotel bar a few times. The hotel restaurant appetizers were tasty and reasonably priced. Service was excellent. Extremely happy with location, staff, room view!!! The hotel is located far from main street. So walking was very difficult to me. We were very pleased with our room. It was clean, quiet and very comfortable. The staff was personable and helpful with directions to nearby attractions and restaurant recommendations. It's an easy walk or short drive to the Las Vegas Strip located just two blocks away. Due to the weather, we didn't get a chance to use the pool or hot tub. Both looked very inviting. We would definitely stay at this hotel again. If you're looking for a quality hotel and you need to be near (but not on) the strip, this place is great. Need a cab to get to and from this place as it's toward the very north of the strip and the action's a bit further south, but if you need a place to sleep at night and don't want to pay an arm and a leg, this is a good business hotel that does what it sets out to do. The staff is friendly and price was unbeatable! Go eat at the seafood buffet at Rio Hotel. Las Vegas Convention Center is a short stroll from Las Vegas Marriott, and other popular attractions like Fashion Show Mall are within a mile (2 km). This 278-room, 3.5-star hotel has a restaurant, an outdoor pool, and a 24-hour fitness center. This hotel is home to a restaurant and a bar/lounge. Savor a meal from the comfort of your room with room service, or get a quick energy boost at the coffee shop/café. Start each morning with buffet breakfast, available for a fee from 6 AM to 11 AM. Guests can expect to find WiFi and 42-inch a Smart TV with cable channels and pay movies. Pillowtop beds sport pillow menus and the bathroom offers a hair dryer and designer toiletries. Other standard amenities include an iPod dock, a refrigerator, and a coffee maker. 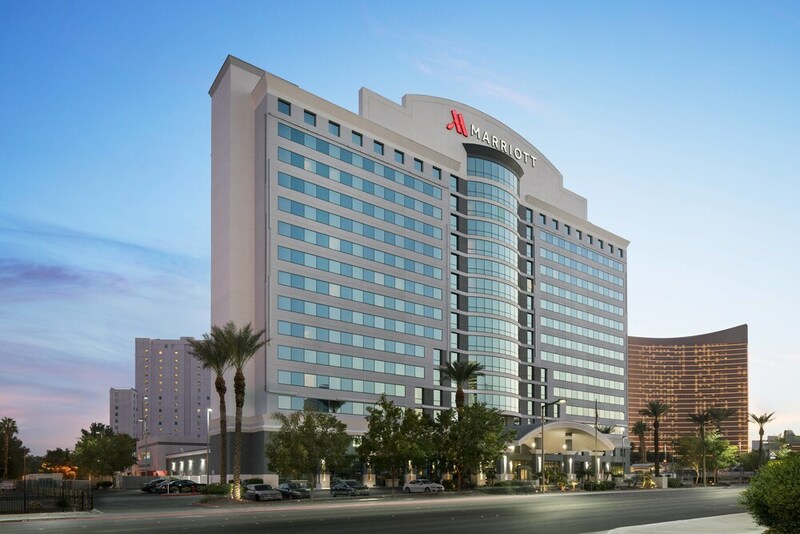 Guests staying at Las Vegas Marriott enjoy an outdoor pool, a 24-hour fitness center, and a spa tub. Self parking is available for USD 15 per night. The front desk has multilingual staff standing by 24 hours a day to assist with securing valuables and dry cleaning/laundry. Additional amenities include free WiFi in public areas, conference space, and a business center. Cafe 325 - Restaurant specializing in American cuisine. Open daily for breakfast, lunch, and dinner. The Garage - Theme restaurant and bar specializing in American cuisine. Open daily for lunch and dinner. The front desk is open 24 hours a day, and checking in and out are easy with express services. Driving? This property offers parking (fees apply), along with a car charging station.